These two words headlined the iconic 1959 VW Beetle ad that would eventually be named by Ad Age as the top advertising campaign of the 20th century. And this ad offers valuable insight into a timeless marketing principle for how entrepreneurs can strengthen their position within their customer’s mind: Find a hole and fill it. Consider the headwinds Volkswagen faced when introducing the Beetle to the U.S. market in 1959. It was only 14 years since the end of World War II, and here was this German automaker audacious enough to think that any American would want to buy a car that had been one of Hitler’s pet projects. And at the time, Americans appeared to be in love with big, fast, beautiful cars as a status symbol—and that’s what U.S. automakers were delivering. So, here comes the Beetle. It's everything the American cars weren't: small, ugly, and slow. If you’re VW, how do you break through? What’s your path to success in the U.S. market? And that’s precisely what VW did with great success, as sales took off. 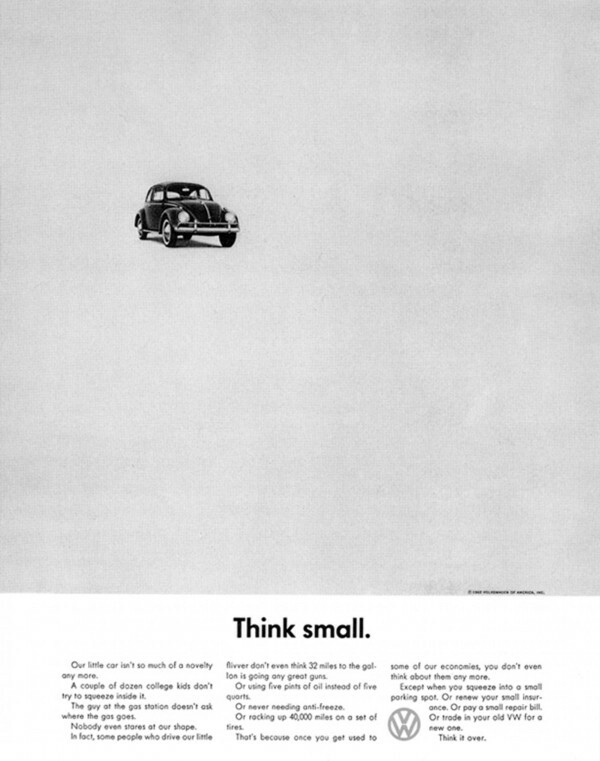 The ad didn’t try to position the Beetle to outdo the competition on their turf—you know, to be bigger, faster, or more prestigious. Instead, the automaker staked claim to its own territory in the U.S. market—one where it could stand out—with an ad campaign that gave voice to an emerging group of customers who wanted to go against the grain and own a car that encapsulated their counter-cultural ideals. What’s the lesson here for positioning our products and services? The idea here is differentiation. If competitors are moving in one direction, go another. Stake claim to a market position in the prospect's mind that makes you stand out. Otherwise, if you're like everybody else—merely trying to be "better" than the others—your message will be drowned by the noise. So, what long-held assumptions are you seeking to challenge with your product or service? Or, put another way, how are you defying conventional wisdom—the beliefs many people take for granted to be true? Pitch: “Conventional wisdom for commercial HVAC contractors is to ‘earn the business' with the lowest price. But the property managers who choose the lowest bid often get frustrated with the lower standard of service they receive. And when the equipment breaks down, and air doesn't blow cold, that makes their customers uncomfortable, directly impacting their business operations. So, while we may not be the lowest price provider upfront, we're usually the lowest cost in the long run by ensuring each job is done right the first time." In a world of increasing distraction, there's only a limited amount of "real estate" inside your customer's mind where you can make an impact with your marketing message. So, avoid the crowd and "Think small." Find the hole—the créneau—and fill it.